From 'Covfefe' to #FraudNewsCNN and #FakeNews, Donald Trump's tweets have caused an international frenzy. He is a reality TV and Twitter-President, who uses digital and entertainment culture as an ideological weapon - as an expression of his authoritarianism. This book delves into new political-economic structures as expressed through political communication to explain the rise of authoritarian capitalism, nationalism and right-wing ideology throughout the world. 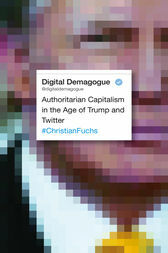 Christian Fuchs does this through updating Marxist theory and the Frankfurt School's critical theory. He re-invigorates the works on authoritarianism of Franz L. Neumann, Theodor W. Adorno, Erich Fromm, Herbert Marcuse, Max Horkheimer, Wilhelm Reich, Leo Lowenthal and Klaus Theweleit in the age of Trump and Twitter.